Love this stuff! 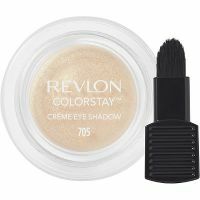 This cream eye shadow has a slightly silkier texture than other cream eye shadows, which means it goes on and blends like a dream -- no tugging necessary. True to its claims, it lasts all day. The package is also really clever. The tiny pot conceals a brush that you can stash, so you don't have to worry about it getting lost in the bottom of your makeup bag. The cherry on top? The price (less than $8). I took this product at Mary's urging and I'm so happy that i did. While the pot comes with it's own brush, I liked applying it with my finger. It looks equally gorgeous as an all over eye color or a base/brow highlighter under other colors. It had amazing staying power - no creasing all day!